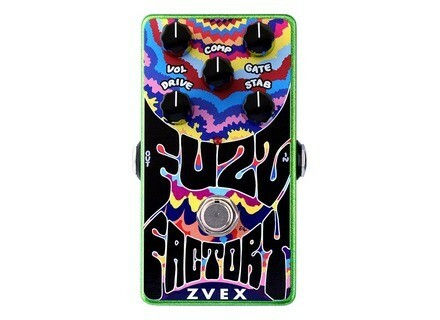 Fuzz Factory Vertical, Fuzz pedal from Zvex. 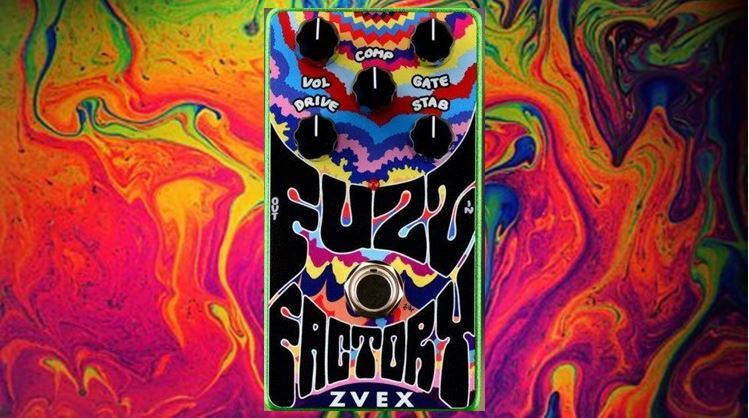 The Fuzz Factory is one of those classic pedals that originally put ZVEX on the map. You can dial into some great distortion and fuzz tones, and even some freaky feedback if that’s up your alley. The YouTube demo below includes several settings, although I kept it more conservative and traditional. Some of the functions are straight forward, such as the volume, gate and compression. Obviously you use the GATE to reduce any background noise (unless you want to hear added squeals and burps from the STAB (stability knob), and the COMPRESSION is excellent in pinching the tone or it can be used to smooth things out if you want a velvety sound. The DRIVE is very nice, in that you can achieve a gritty and dirty overdrive or distortion, more so than a fuzz quality… but turned all the way up and it sizzles very nicely while remaining clear in the mix. The drive also alters the tone, so that turned toward the left you get a deeper and thicker sound with more grain, whereas you get more clarity and treble when turned to the right. The STAB or stability controls the feedback pitch (low when turned left and high when turned right) – all the way right and it’s quiet as a mouse, but turn it left and past 2-o’clock and you can get some freaky results (that can be controlled or manipulated with the compression and gate). The sound of this pedal is very much like other ZVEX pedals… it sounds like a ZVEX. 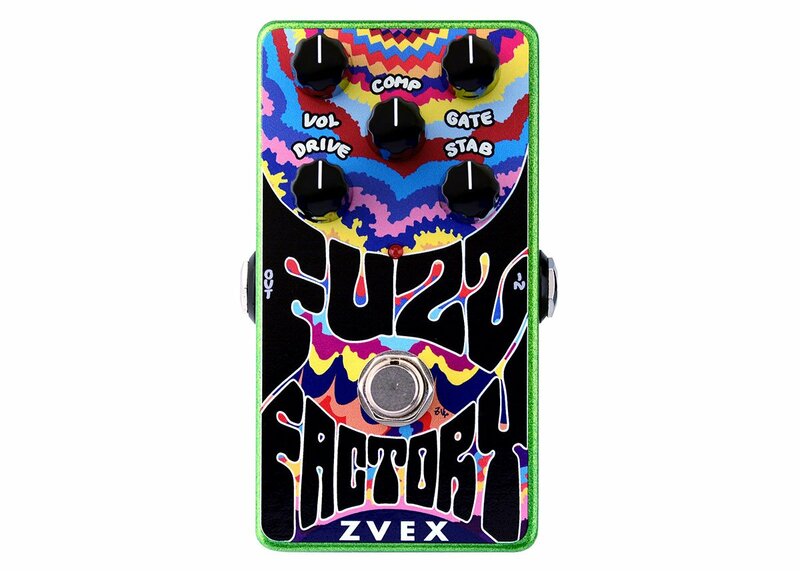 There is something very raw and organic about this company’s analog equipment and with their own characteristics, and the Fuzz Factory is no exception. Some other fuzz pedals, even if analog, have a more processed sound, whereas you can hear every detail in the Fuzz Factory, like bacon slowly cooking in a cast iron frying pan. Encased in steel, the Fuzz Factory has a metal foot switch (for on and off) and plastic knobs. The foot switch is far enough removed from the knobs that there shouldn’t be an issue of damage caused by stomping. The standard 9v power input is located at the back, whereas the input-output are located along the sides. It’s interesting that a well-known gear reviewer on YouTube considered the Fuzz Factory to be in the top 10 worse pedals… ever! I can only hazard a guess that he did not control the feedback (from the STAB knob) by way of the compressor or gate… both of which can allow squeals and pops to trickle in, if desired, or become blatantly obnoxious (if you want to go that route). If you avoid the STAB all together you can some great thick distortion that transforms to a very fine and smooth fuzz… you then can get a very punchy effect with the compressor and, of course, have the signal super quiet with the gate. And so, I have no idea what the heck he did with the pedal when reviewing it. The Fuzz Factory is not difficult to use, but you will need to do some tweaking to discover how smooth, punchy or ‘wild’ you want the tone. Avoiding the STAB narrows your decisions and makes it easy to use, although some bubbles, burps and screeches in the mix certainly are fun and entertaining. There are no downfalls, unless you don’t like the particular tones of the Fuzz Factory… it does what it’s supposed to do and with very good versatility. It operate on a 9v battery, but also accepts a basic 9v power supply while consuming a paltry 3 mA.